$0.45. That’s the amount of change I’ve found on the ground in the past two months. 1 Quarter, 1 dime, and 10 pennies. And every single time I see one of those shiny little friends my eyes grow wide and my heart happier! The best guess I came up with is that finding money on the ground comes as a nice *surprise* you weren’t really counting on, whereas going out and earning it is more of a routine based around every day scheduling. Not that I count my mentoring money as something solid and essential, or that it doesn’t feel GREAT to tget the business, but it does all go into the “life’s bills” pot vs. the “holy crap, a free dime!” one. But the problem with this line of thinking, of course, is that life doesn’t work that way. Yeah I’ll have a grand ol’ time dicking around the city and making a “thing” out of it for a day – and maybe even triple, or better yet, quadruple my findings! Imagine that! – but come day two and day three, it all starts turning into a “job” again and you’re right back to where you started from. Except down three solid days of hustling and real income-generation. These are the things we entrepreneurs think about :) Always trying to find that *perfect* hustle out there that nets us tons of (recurring) cash, while at the same time immense pleasure. Where we can say things like, “I don’t work for a living – I play!” Or, “Look at all the smart passive income I have! I barely work at all and watch it all flow in!” Even though, contrary to belief, we DO work more than the average person out there and it’s rarely ever passive. I used to tell people all the time I make passive money from this blog until some (much wiser) person asked me how long it took for me to write my post today. I guess that’s the point to all this rambling today. It’s great to think about cheating the system and reaching your goals faster, but you also have to remember that most good things take time. And everyone around you is sitting there in the same boat along for the ride. You’re certainly not alone. And, if anyone would like to have some more J. Money in their lives anytime soon, please do let me know. If I can’t survive off the pennies from the street, I can at least go for the next best thing with the consulting! :) Just imagine all we can talk about in an hour! The joys are endless! PS: That’s a real snapshot of all the coins I found up there, along with an old school $100 bill… They may not be pretty, but they’re still FREE MONEY!! Good article…I too get somewhat excited when I find money. I recently found over $3 in change in a rental unit that just about filled a coffee cup. Side note…the tenant that departed…NEVER paid rent on time….and ALWAYS paid a late fee. This sounds like a good subject for a grad student’s thesis on human behavior….IMHO. Ouch. If only the tenant left about 100 of those cups full of change! Great read–found money is fun but earned money is better! I’d rather find $1 than earn $1… the found money is tax free, whereas the earned money must be declared on a tax return and I’ll only end up with about 65 cents. There definitely is a rush with finding money that doesn’t occur when earning it though, perhaps we become desensitised to earning over time? We totally get desensitized to earning money over time. At least I know I have. It takes more and more to REALLY get me excited these days, unlike before. Though, I’m also like that with everything in life ;) Luckily small things – like finding pennies on the ground – excite me as much as normal things. I LOVE finding money! I have found a few twenty dollar bills and there is such a rush :) haha I also recently had a $150 win playing craps at the casino–I wish I could do that every day! haha they DO think our ideas are great! And I actually think theirs are too :) they’re nice and pure and innocent and not jaded by the world yet, haha… Those little boogers. Good post J$. 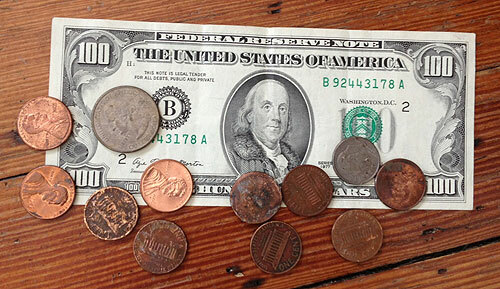 I love finding money as opposed to earning it, but then you have to look at the time it took to “find” said money. I used to find pennies some times but the Canadian government has eliminated them so my found money total for the entire summer is zero. People used to toss their beer bottles out on lawns but that source of income has dried up too. Drunks are being more responsible with their money and cashing their bottles in themselves. Finding money is the most exciting feeling ever. I got to be honest though, I rarely pick up the pennies. Also, I love when I find money in clothes that I haven’t worn in a long. Sometimes I find $20 and $50 bills. Surprisingly I didn’t miss it at all. Nice article! I agree 100% that many of us (myself often included) always seem to be looking for that magic idea that will make us money without us having to “actively work” for it. As you pointed out, this isn’t realistic. This is why it is so important to make sure your active work is something you are truly passionate about. Make sure that thing on which you are spending more than half your waking hours is worth it! I also get excited when I find money. The other day I found ONE DOLLAR on the ground and had a giddy look on my face all the way to my car haha. YES! AWESOME!! Finding bills laying around is even more magical! Congrats! I love found money too, but working pay off much better for me. Wowww your kid is GOOD! Found $50 recently! It was the BEST feeling ever initially. Then I just felt guilty and had to donate some of it to alleviate the guilt. After all, some poor person lost it…There is a certain amount over which the guilt >> elation of serendipity for me (and yes, I tried to find the owner of the $$ but there isn’t much you can do when it is cash on a sidewalk…). The best thing about found money is that it is TAX FREE!!! Have you ever found “big money”? Meaning actual dollar bills or even a fiver. I have and it makes me anxious. With coins I think YES! FREE MONEY. With bills I think, oh no, this isn’t mine and I don’t know who to return it to. Finding money on the ground makes me feel like a kid! Haha…and its always unexpected too! I’m not constantly walking round scanning for money so when I do find it it’s a nice surprise! Plus the only thing I had to do for it is bend over and pick it up! I’m the opposite. I LOVE earning money with side hustles, and coming up with new strategies to make it happen. I like the challenge! But finding money is awesome, and I usually just pocket it and spend it on something useless, because it’s unaccounted for. If it’s a big bill, then I’ll save it, but that rarely ever happens. Earning money is definitely more *rewarding*, that’s for sure. Especially if it came from a single idea in your head and played out nicely in the real world for you :) Finding it is just pure sexiness. Thanks Brutha! I’ll def. hit you up as soon as possible. Also, hope to see you at FinCon, I’ll be flying in Friday afternoon! Yessir! I shall be there nice and hyper as always ;) Look for the guy with the mohawk or beard. And perhaps, both. Found money is awesome because it’s a surprise. I’m never surprised when my boss pays me… well actually once I was. I thought sure he was going to fire me after one week. Sure enough he paid me and didn’t change the locks! Some one else mentioned bottles and cans… I’m becoming less and less ashamed to admit that I collect bottles and cans when I run. The other day I found a 30-rack of empties nicely packaged back up in the box! I didn’t want to run 3 more miles with a 30-rack so I came back for it with my car on my way to the store. In hindsight, running with a 30 would have got me more honks than running shirtless so maybe I should have done it. The last time my husband and I were in Vegas, he found a $20 bill on the ground. This is not uncommon for him. The man doesn’t gamble but he still beat the odds. You should spend more time walking beside gold nugget filled rivers ;p That would be some exciting finds! I found $1,000 once. It belonged to a homeless lady who was more concerned about her missing shoe than the $1,000 that she left laying on the sidewalk. I returned it, but I still kind of regret it sometimes because I know that she lost it again within a matter of hours. Oh well, at least I did the right thing. I can’t believe I’m going to admit to this as a personal finance blogger, but I rarely pick up change. If it’s a quarter or larger, I usually will, but pennies, nickles and dimes – nope! I love earning money, though. What a beautiful story!!! And so nice of you to stop by and help him – I’m sure he was pretty shooken up :( We need more people like you in the world! Previous post: Say Hello to RockstarFinance.com! Next post: All the fun of trading, with none of the headache!